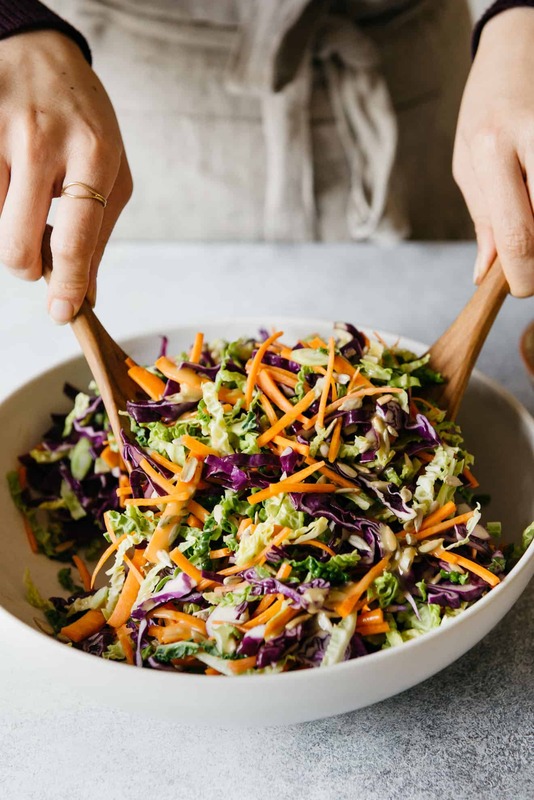 This cabbage and carrot slaw with almond butter vinaigrette is an easy-to-prepare crunchy salad that is great for BBQs or as a side dish. 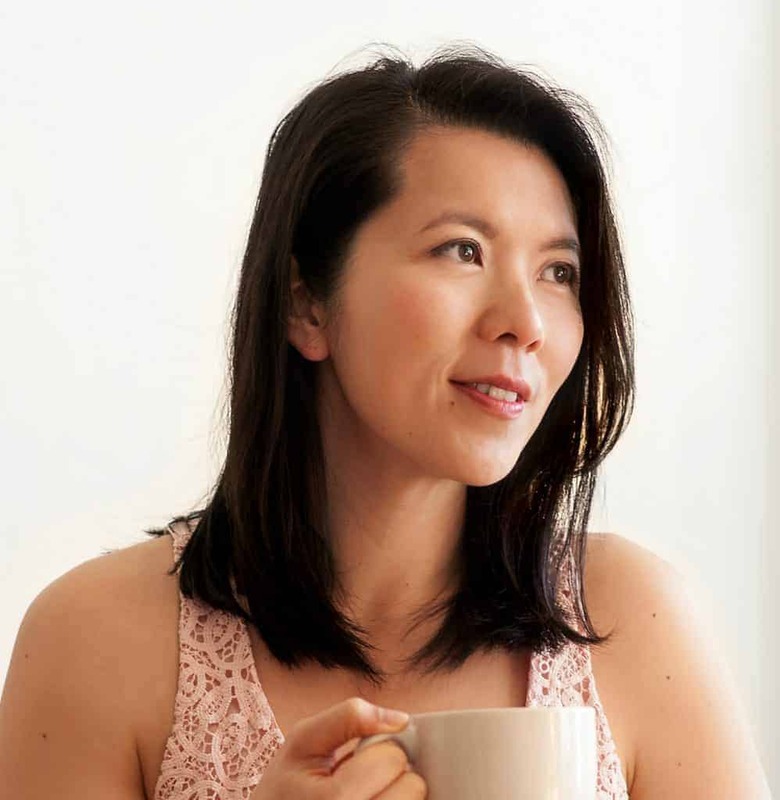 Thank you to Nature’s Intent Apple Cider Vinegar for sponsoring this post! 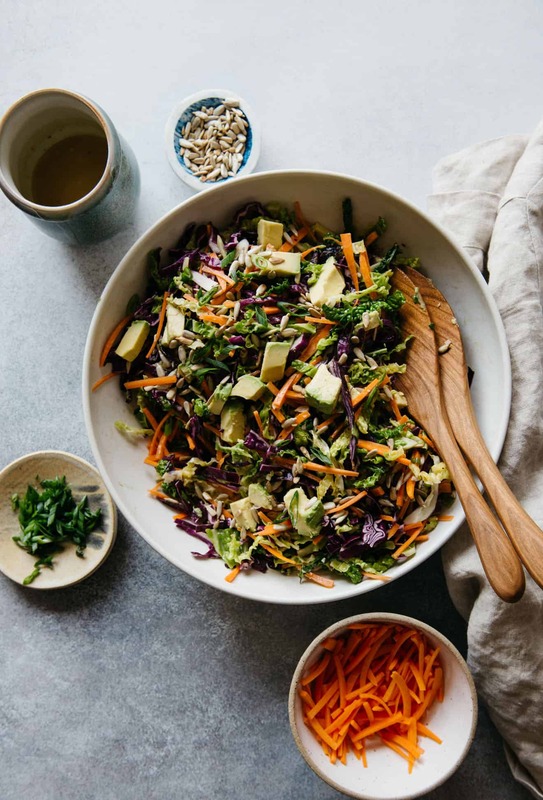 After eating more cookies, brownies and cheesecake than my waistline can handle, all I craved was a good salad—something light, bright and crunchy. 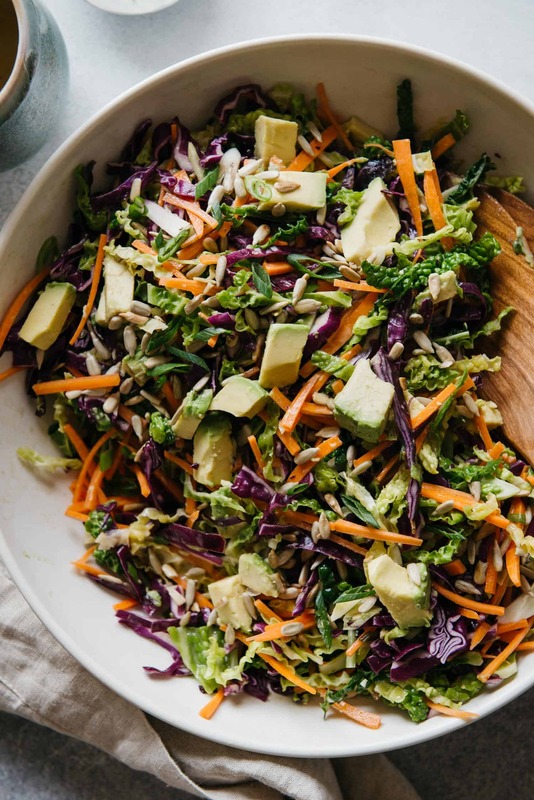 This cabbage and carrot slaw fits the bill entirely. I gathered all the partially-eaten wedges of cabbage, loose carrots and scallions I found in my fridge and chopped everything up. Then, I added diced avocados and toasted sunflower seeds for nutty flavor. 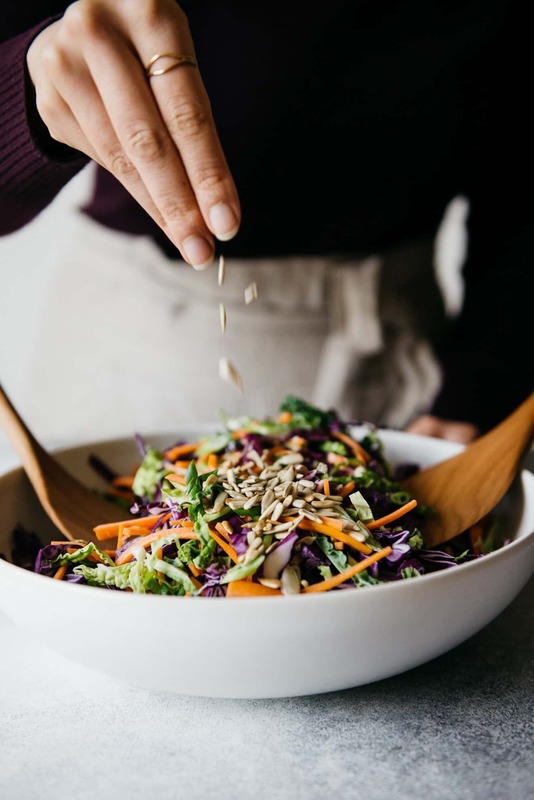 Honestly, sunflower seeds are underrated because they’re inexpensive and can easily turn salads and dips from drab to fab. For the vinaigrette, I mixed together olive oil, Nature’s Intent Apple Cider Vinegar, almond butter, garlic, honey and salt. The result is a nice and creamy vinaigrette with a light tangy finish. What I outlined below is a good basic recipe that you can tweak and adapt with whatever you have in the kitchen. 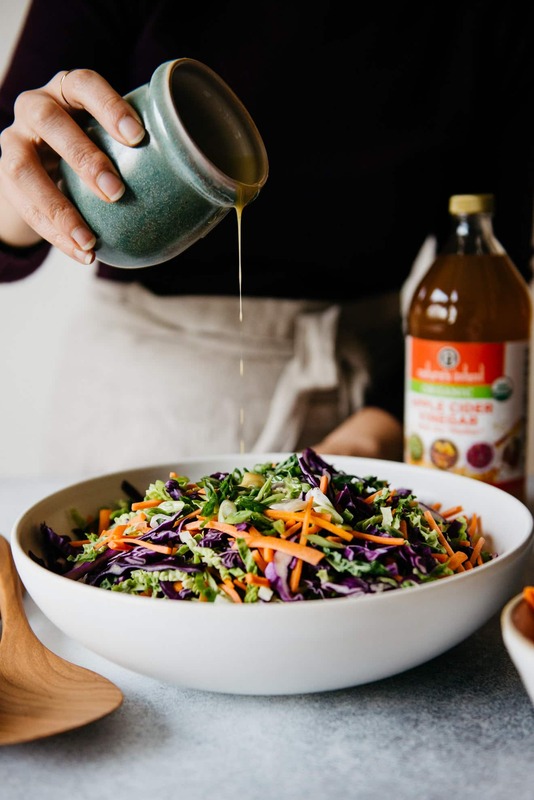 For example, if you want to add another layer of flavor to the vinaigrette, try mixing in 1/2 teaspoon orange zest and a few tablespoons of fresh orange juice. It’s delicious! Prep ahead: You prepare nearly all of the salad the day before. Chop the cabbage, carrots and scallions, mix it all together and refrigerate the vegetables (undressed) in a plastic bag or container. You can also make the vinaigrette ahead. Depending on the temperature of your fridge, the olive oil and almond butter might solidify. When you are ready to serve, just let the dressing sit at room temperature for 15 to 20 minutes. This should warm up the olive oil. Give everything a stir before tossing with the vegetables. 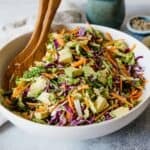 Types of cabbage: In the recipe, I’m mixing red cabbage and savoy cabbage together, but you can use green cabbage or Napa cabbage for the slaw. There’s also nothing wrong with sticking to one type of cabbage for the recipe. 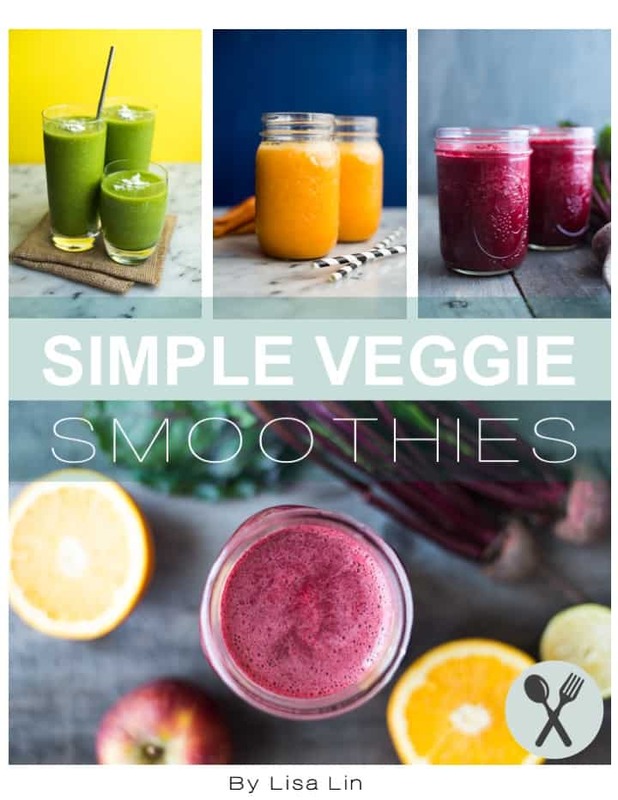 I like my salads to be more colorful, which is why I blended 2 varieties. Using a fork or whisk, mix together the ingredients for the vinaigrette in a bowl. It can take a little while for the almond butter to break apart. Just keep stirring, and it will eventually blend nicely into the vinaigrette. Set it aside. Slice the cabbage into 1 1/2-inch chunks. Slice each chunk into thin strips, about 1/8 to 1/4-inch wide. Peel the carrots and chop the carrots into matchstick pieces. Transfer the cabbage, carrots and scallions to a large mixing bowl. Quickly toss the vegetables. Toast the sunflower seeds on a pan over medium heat. The seeds should be ready in 2 to 3 minutes. Stir frequently to keep the seeds from burning. Transfer the seeds to the bowl with the vegetables. Add the cubed avocado to the bowl. Drizzle about 2/3 of the vinaigrette over the vegetables and toss everything together. Taste and adjust the seasoning to your liking, adding more vinaigrette or a pinch of salt, if necessary. Disclosure: This post was sponsored by Nature’s Intent Apple Cider Vinegar! 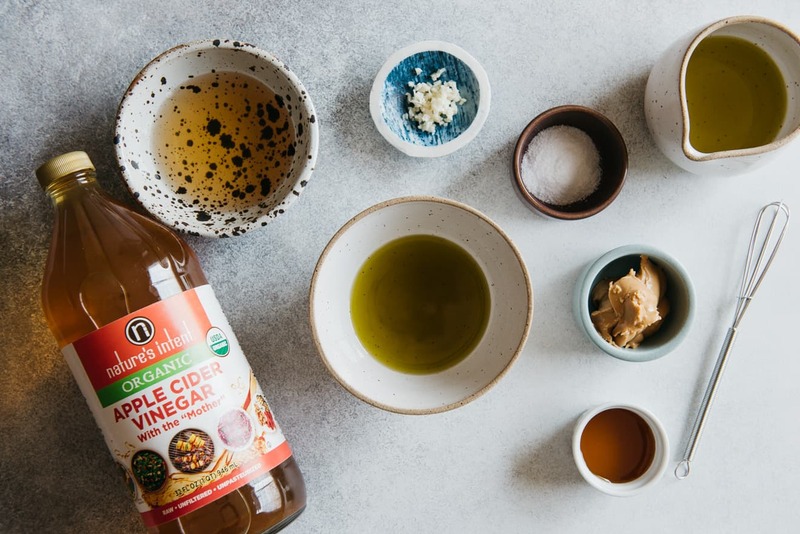 To learn more about their apple cider vinegar and to get more recipe inspiration, visit their website or follow them on Instagram. This recipe was amazing! I had cabbage that I bought as a challenge to use because it isn’t a go-to vegetable for me. This with carrots from my farmer’s market was a great side to tuna sandwiches. I can definitely see this being a staple. And now sunflower seeds will be a fun ingredient to have on hand and experiment with. Thanks! Lala, thanks for trying the recipe! I’m so glad you enjoyed it!